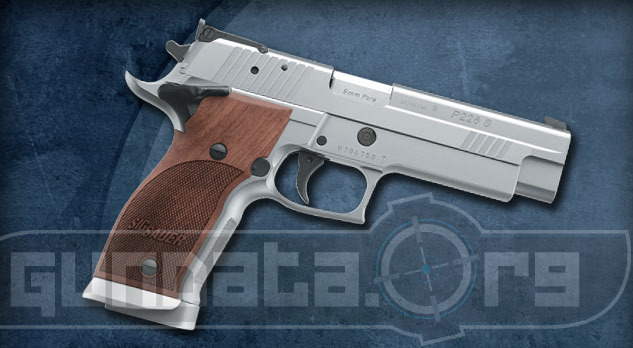 The Sig Sauer P226 X-Five is a large frame, semi-automatic handgun, designed for recreational, competitive, along with self-defense shooting purposes. It was designed for bulls-eye and other centerfire pistol competitions. They are test fired at a range of 25 meters for accuracy. It has a beavertail frame, with an ambidextrous thumb safety switch, and a stainless steel magwell on bottom of the grip. The trigger is single action only (SAO), and allows users to adjust the pull for competition uses that range between 2 to 4 pounds of pull on the trigger. The overall length of the P226 X-Five is 8.8-inches, with a height of 5.9-inches, and a barrel length of 5.0-inches. The frame material is made from stainless steel, with a natural stainless finish. The slide material is also made from stainless steel, with a natural stainless finish. The grips are checkered ergonomic wood Nill grips with front strap serrations. The P226 X-Five can hold two calibers of ammunition, which are 9mm and .40 S&W. The magazine capacity is 19-rounds for the 9mm, and 14-rounds for the .40 S&W. The sights are low-profile adjustable sights.